NEW YORK, NY.- Sara Kay Gallery announced In The Studio, Process and Presentation, Victoria Manganiello. As part of Sara Kay Gallerys continued commitment to the support of women artists, Manganiello has been selected as the recipient of the Gallerys first working residency. 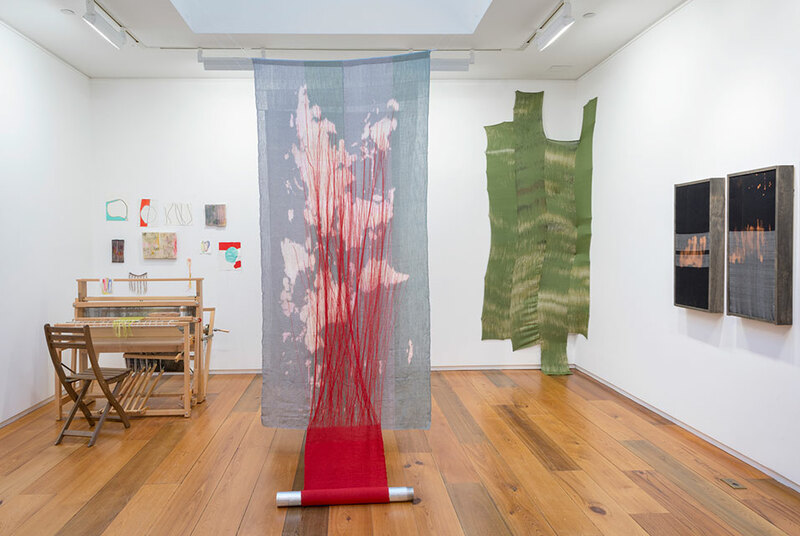 The contents of Manganiellos studio, which include a loom, raw materials, fibers and dyes, tools used by the artist to manipulate her forms, sewn drawings and studies have been installed throughout the space. In addition they have been hand-spun, hand-woven and hand-dyed installations, paintings, and sculptures; some complete, others in progress. With an interest in the interplay of the natural and synthetic material and the expanded use of the loom, the artist transforms her raw materials to create complex woven paintings and sculptures that challenge the historical definition of craft. I employ very technical and strict processes, but then purposely break these conventions to create different effects. By playing with tension and balance with a tool that is meant to maintain evenness, I can skew order, manipulate time. Starting with raw fiber, pigments and color-yielding plants, these components are rearranged in a new configuration as they pass through my hands and tools to create unique works, says Manganiello. One of two large-scale installations exhibited in the gallery is Axis, made of natural and synthetic fiber and dye. The installation, consisting of nine panels suspended in the air and linked by many threads, delineate and explores the space it currently occupies. Manganiellos interest in sculptural manipulations is further explored as some of the artworks evolve and metamorphosize during the residency. The studio and installation is accompanied by a film detailing Manganiellos working process. Manganiello will also be leading experimental weaving workshops for the public.